Assassin's Creed Odyssey brings the franchise to Greece in 431 BCE for a story about family and mysterious cults. 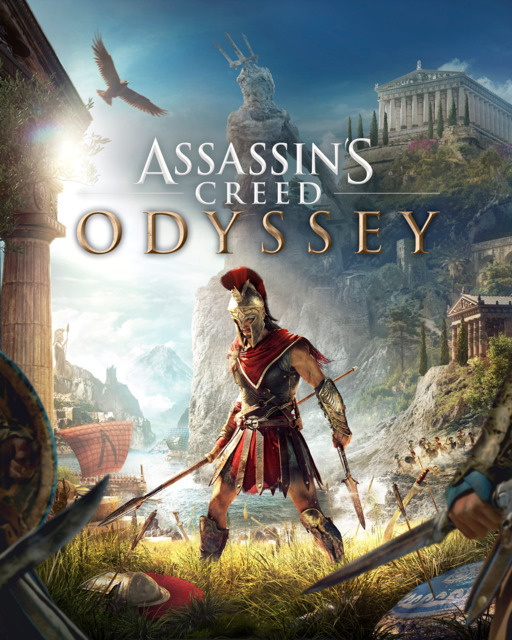 Assassin's Creed Odyssey is the follow-up to 2017's Assassin's Creed Origins, which reinvented the series' formula in more of an open-world RPG direction. The game is set in 431 BCE at the start of the Peloponnesian War between the Delian League, headed by Athens, and the Peloponnesian League, headed by Sparta. Players take on the role of a mercenary as they explore ancient Greece. Odyssey features a choice between a male or female protagonist--Alexios and Kassandra. The two are siblings and descendants of Leonidas I, and as children were cast off of a cliff by their father at the urging of the local oracle. The protagonist chosen by the player survives the fall, and as an adult becomes a mercenary (misthios) on the island of Kephallonia. The misthios leaves Kephalonia to find their mother and soon discovers the existence of the Cult of Kosmos, a secretive organization that seeks to control the Greek world by manipulating local politics and economics as well as the ongoing Peloponnesian War. The main story of Odyssey encompasses these two threads which intertwine frequently throughout the game. The world of Assassin's Creed Odyssey is completely open from the start and features the mainland of ancient Greece as well as many of its islands in the sea. Much like the game before it, Odyssey does not have a mini map. Instead, the game uses an overhead compass to direct players to locations. These locations include towns, forts, ruins, camps, animal dens, and more. Players explore the map completing quests and acquiring loot in the form of weapons, bows, and armor pieces. In combat, the player can use one- and two-handed weapons as well as a bow and arrow. Adrenaline is built up during combat that is used to perform powerful melee and ranged abilities. Ability Points are earned from leveling up and are used to unlock and upgrade abilities. Shields can not be used; instead players must dodge or parry attacks to avoid damage. Odyssey features an expanded loot system. Weapons and individual armor pieces can be swapped and upgraded, and everything comes with perks that increase certain stats. If the player equips an entire set of Legendary armor, they will activate additional perk bonuses unique to that armor set. Odyssey has a transmogrification feature that allows the appearance of weapons and armor to be freely changed. The misthios is in command of their own ship called the Adrestia. The ship is fully manned and her combat effectiveness can be upgraded using the various resources collected throughout the player's journey. There are three primary attack methods: an arrow barrage, spear barrage, and ramming. Arrows and spears can also be lit on fire to force an enemy ship to stop and put out the flames. Once an enemy ship's health bar has been depleted, she will be dead in the water. Players can destroy the ship immediately with a follow-up attack, or it can be boarded to engage the crew in melee combat. Sinking enemy vessels restores some health to the player's ship, but boarding and defeating an enemy crew restores the most, in addition to the benefit of allowing the player to loot treasure chests on the deck. The Adrestia can have four Lieutenants on board, high-ranking NPCs that board enemy ships with the player. These Lieutenants are recruited by offering to bring aboard quest-givers, or by knocking unconscious a hostile NPC. Lieutenants follow the same rarity system as the loot; higher tier Lieutenants carry better stat bonuses for the ship. Odyssey features a bounty system wherein the player will have a price put on their head as they continue to engage in combat. Depending on the level of bounty, up to five mercenaries will begin hunting for the player. These mercenaries have names, backstories, and loot that can be viewed in the Mercenaries screen. Clearing a bounty can be done by laying low, paying off the bounty in the Map screen, or killing the bounty sponsor. The Cult of Kosmos is widespread and has infiltrated every aspect of Greek society. The Cult screen displays the web of associations, tying the various political, military, and economic branches of the cult to the Sages who oversee those operations. As the player explores Greece, they will uncover clues as to the identity of these cult members. When enough clues have been discovered, the player can reveal the identity and location of the cult member in question. Eliminating a cult member grants a Legendary weapon or armor piece, as well as a clue towards the identity of the members' Sage. The Peloponnesian War was a 27 year long conflict between the Delian League, led by Athens, and the Peloponnesian League, led by Sparta. The war ran from 431 BCE to 404 BCE and dramatically reshaped the balance of power in ancient Greece. In Odyssey, every region of the map is controlled by either Athens or Sparta and has it its own leader. Nation strength in a region is affected by the player eliminating soldiers and ships, burning war supplies, and looting treasuries. As a region is weakened, its leader loses favor and becomes more vulnerable to assassination. Assassinating the leader dramatically lowers nation strength. When strength is lowered enough, a Conquest Battle becomes available, wherein the player can choose to support Athens or Sparta in a massive battle on land or at sea. The winning side takes control of the region and repopulates the camps and forts.